Fresh out of the oven, covered in a glorious garlic herb oil. 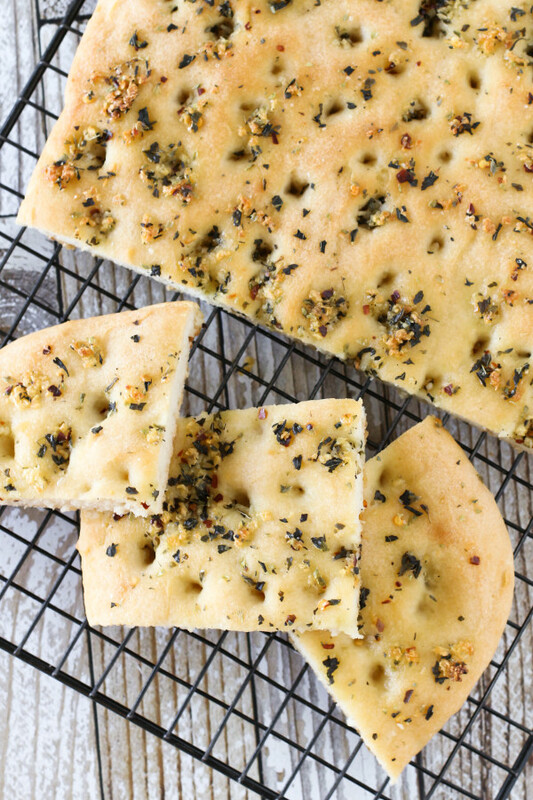 This gluten free focaccia bread is everything you would hope it would be. Bursting with so many flavors, so soft and so savory! Sometimes when you have pasta for dinner, you just want a slice of warm bread to sop up the extra sauce. I know I do. 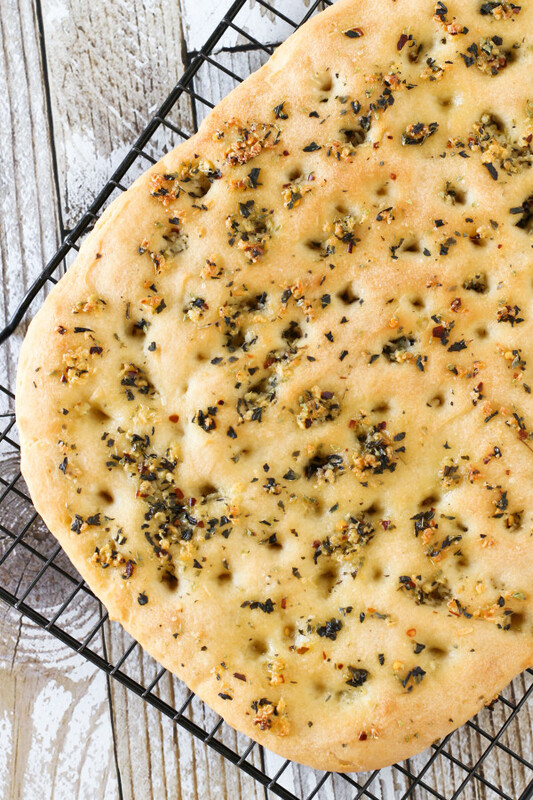 This simple garlic herb focaccia bread pares beautifully with just about any of your favorite pasta dishes or hearty soups. In the summertime, it would also be lovely with a big fat greek salad. The addition of the crushed red pepper flakes really makes this bread BURST with flavor. It gives that garlic herb oil an extra kick. If you don’t like that much spice, feel free to omit from the recipe. I LOVE spicy food so I say the more chili flakes the better! Whatever your preference, I just know you all are going to fall in love with this homemade focaccia bread. It is so simple to make, with only a few ingredients. This yeast-free bread also bakes in no time. Full of fragrant herbs and loaded with fresh garlic, I’m completely hooked on my new bread recipe. Garlic-herby bread for the win! Preheat oven 450 degrees. Line large baking sheet with parchment paper. In small bowl, mix together 2 tablespoons olive oil, garlic, oregano, basil, red pepper flakes and 1/4 teaspoon salt. Set aside. Whisk together flour blend, baking powder and salt in large mixing bowl. Add sparkling water, 2 tablespoons olive oil and maple syrup. Mix until just blended. Pour batter into center of baking sheet. Using rubber spatula, smooth out dough to 12x9-inch rectangle, about 1/2-inch thick. Spread garlic herb oil over top of dough with pastry brush. Using finger, poke indents into dough, 1-inch apart. Bake bread 20-22 minutes or until golden brown, rotating pan after 10 minutes of baking. Allow to cool 10 minutes before serving. 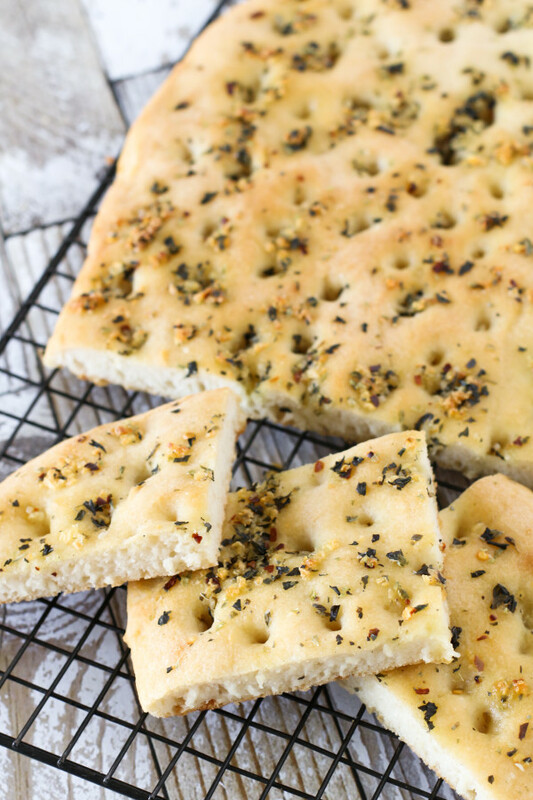 Slice warm focaccia bread. Best served served warm, right after baking. My goodness… this is a masterpiece! I am frequently wowed by the recipes you post but this is the one that finally compelled me to leave a comment. It’s stunning! Thanks so much for sharing. I love homemade focaccia!! Such a classic! Wow!! This focaccia looks perfect!! Can’t wait to try it! That garlic herb oil sounds SOOO good! Mmm, I am so obsessed with focaccia. We use to put cheese on it, but one of my kids just went dairy-free, so this is perfect timing! Yay! Hope you and your family enjoys it! This bread looks absolutely amazing! Focaccia is my favorite bread. So glad to have a gluten-free option! I made a test run of this yesterday. I ate the whole thing. It was awesome. Okay, this may sound silly, but what is sparkling water? Do you have a brand you like? Can you show me a picture? It’s basically just unflavored carbonated water. You can find it near the bottled water. Made this last night. Flavor was great. But I followed the recipe and it was still ‘chewy’ in the center. What happened? What can I try to adjust to fix it? Question: if I want to make and take to a party, what is the best way to bring it? Can it sit for a few hours or is it best right out of the oven? It is best served warm, so if you bring it to someones house, just pop it in the oven to heat up for about 5 minutes. I tried making your recipe. I used Bob’s Red Mill All Purpose Gluten Free Mix. When I added the water it became incredibly runny. This is the second time I’ve had this issue with this particular mix. Any ideas what I’m doing wrong? I’ve done successful gluten free baking before with homemade mixes so I’m stumped. Thanks! Sherri, I use Bob’s to get the individual ingredients to make Sarah’s blend. The link is in the ingredient’s list. Not all gluten free mixes are equal, so when following a recipe, especially someone who makes their own mix, it’s best to go with their mix. 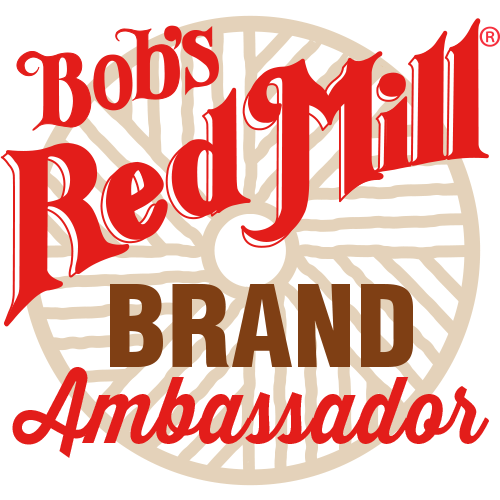 It sounds like the Bob’s Red Mill mix just needs less water. You can experiment or try the tried and tested method with Sarah’s recipe instead. Do you have to use sparkling water? Is there a substitute for it? I just made your pizza 🍕🍕🍕crust last night, and was thinking it would make great focaccia! 😋Haha! My hubby and I love this recipe!! We even enjoyed the 2 pieces that were left over the next day. I changed it up the second time and made it sweeter with a maple syrup, coconut oil and cinnamon glaze/oil and frozen fruit on top. We also put some dried cherries and cranberries right in the bread and changed the oil to coconut. It turned out heavenly (the 2 of us ate the whole thing in one sitting lol). This bread is amazing!! Just made it for the second time to serve with dinner along with some fabulous balsamic and olive oil! So excited to try this I just made it and it’s in the oven now! I’m vegan gluten / wheat free so this could be my go to for bread when needed! Made this last night (served with potato leek soup and faux egg [tofu] salad). Both my son and I thoroughly enjoyed it – DELICIOUS!! Warmed up the last few pieces in a pan and had them for breakfast. Have you tried this dough flatter for pizza? Yes, and it works great!! I made this with a ready-made glutenfree bread mix from Schär because that was all I had and it turned out absolutely gorgeous! Amazing recipe, and interesting that you used sparkling water. Any particular reason for this choice? My non-glutenfree family also loved it 😉 We ate it with a lot of home-made garlic butter and cured meat. Heaven! Hi Sarah: I changed this recipe a bit and turned it into Raisin Cinnamon Focaccia Bread. Added 1 tsp of cinnamon to the flour, omitted the garlic and herbs, and sprinkled the top with olive oil and brown sugar. Delicious!! These look delicious! I’m not the best cook and I am new to the whole gluten free, vegan cooking… Just found out my daughter is allergic to 60+ foods. She cannot have basil and oregano. What would you recommend for other spices? Thanks! Will this recipe work without the sparkling water and just regular water or is the carbonation needed to “rise” the dough a bit and add aeration. Curious is anyone has tried it without. Do you need the sparkling water? Would La Crois work? It is a very lightly flavored carbonated water. If you use La Crois, just be sure to use the unflavored variety. Thank you for this! I think it’s the first bread I’ve really enjoyed since my celiac diagnosis. Will try some of your other breads next! Yay! So glad to hear it worked out so well for you with using Bob’s Red Mill gluten free flour!